First Maintenance came to us looking to revamp their old, dated and impossible to update website. We began the project by creating several design concepts for them, before landing on a design that incorporated aspects of each concept. We built the website within the WordPress Content Management System, to allow the client to be able to easily add, update or make modifications to the website, and allow it to grow and evolve with their business model. 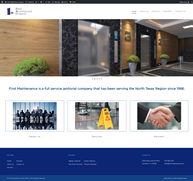 The website was also built utilizing Responsive Technology so that it displays correctly on any device and in any browser. We then optimized the images, content and coding to make the website load quickly and rank as highly as possible in Search Engines for keywords relating to their business. GTmetrix is popular website that analyses website performance and speed. The image below is a screen capture showing the performance score and page load speed for the First Maintenance website.